If you play bridge, you need bridge cards. 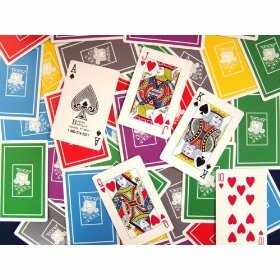 A deck of bridge cards will look the same as a standard 52-card deck - in fact, in Europe, it is the standard 52-card deck. In America, the poker deck is considered the standard deck. Poker decks work fine for poker, but are too wide for bridge. For a complete discussion of playing card widths, please click here. Barclay Bridge Decks are also now available online. The card's the stage in the double bridge deck shown here, that was created in consultation with The Folger Shakespeare Library. This was a very attractive 2-deck bridge set manufactured by US Games - unfortunately, we believe it's gone out of print. Piatnik has a different Shakespeare-themed bridge set. Perfect for the literary set.